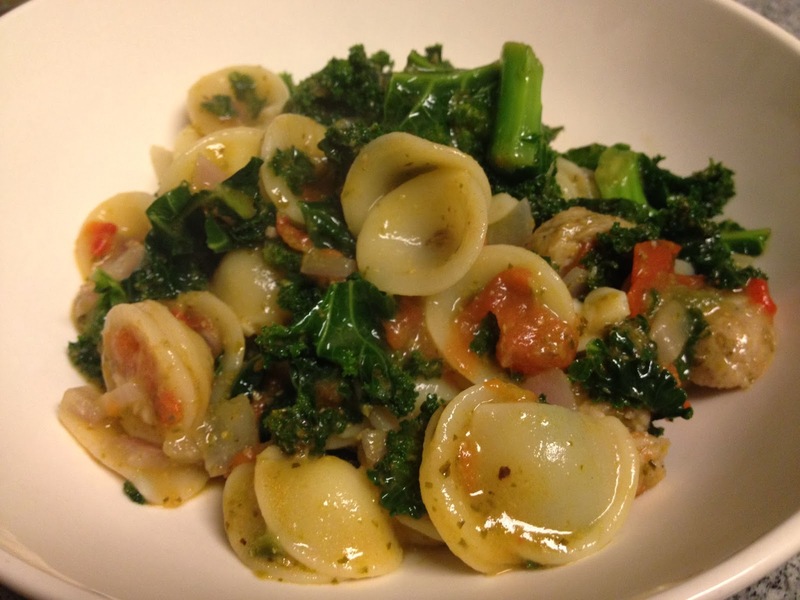 I've always found it amusing that orecchiette means "little ears." Many humans (and dogs) actually do eat pig's ears, so I guess it's not such a foreign concept. But I digress. I'm in "lobe" with a pasta dish—orecchiette with sausage and kale. I often order this sort of dish at Italian restaurants, but recently, I found myself craving it at home...so I made it. Turns out that it's super easy to create this lip-smacking, comforting meal, with a little help from your pantry. Drizzle a large saucepan with extra virgin olive oil. Cook the onion and garlic for approx. 5 minutes over medium heat. While that's cooking, fill a large pot with water and bring to a boil. Add the tomatoes and kale to onion and garlic in the saucepan. Chop up the sausage and throw it in with your veggies. Stir until kale is wilted. Meanwhile, cook the pasta to al dente (taste as you go) and drain. Add the drained pasta to the saucepan along with the pesto and seasonings (red pepper flakes, salt and pepper). Stir and serve immediately. It has finally begun to get a bit warmer here in the city. Central Park is abloom with magnolias and cherry blossoms and dandelions, and the air is filled with possibility. In rereading that old classic, The Great Gatsby (yes, in preparation for the movie, ha), I happened upon a passage that matched this mood to a T.
"And so with the sunshine and the great bursts of leaves growing on the trees—just as things grow in fast movies—I had that familiar conviction that life was beginning over again with the summer. There was so much to read for one thing and so much fine health to be pulled down out of the young breath-giving air." Well put, Fitzgerald. All this spring business makes me think, what foods embody that notion of possibility and renewal? Seeds and grains and eggs are some that come to mind. I happen to like all three. Quinoa is one of the seeds I recently learned how to cook. And I discovered that it tastes darn good with eggs and hummus. Add a poached salmon fillet and it's a light yet hearty dinner. Find a pot that has a lid and drizzle it with olive oil. Add the onion and saute over medium heat until translucent, about 5 minutes. Then add in the water and bring to a boil, then add the quinoa and bring to a boil again, and cover. Turn down the heat slightly and let it simmer for 15 minutes. Turn off the heat, but don't lift the lid just yet. Let it sit for about 5-10 minutes. Alas, fluffy quinoa requires patience, young grasshopper. Meanwhile, let us distract ourselves from hunger by preparing the eggs. Set a nonstick skillet over high heat and a drizzle a bit of olive oil inside. Add in the tomato and garlic. Let cook for a about 5 minutes (I like to smash the tomato a bit with a wooden spoon to get all the juices out) until the tomato is really broken down. Add a bit of water if it looks too dry; the consistency should be slightly watery. Crack in the eggs and beat with a wooden spoon until the yolk is broken up. Let cook a bit before flipping the eggs and breaking them up a bit more. Add in the scallions and season with salt (and a pinch of sugar, if you like) when the eggs are just about solidified. 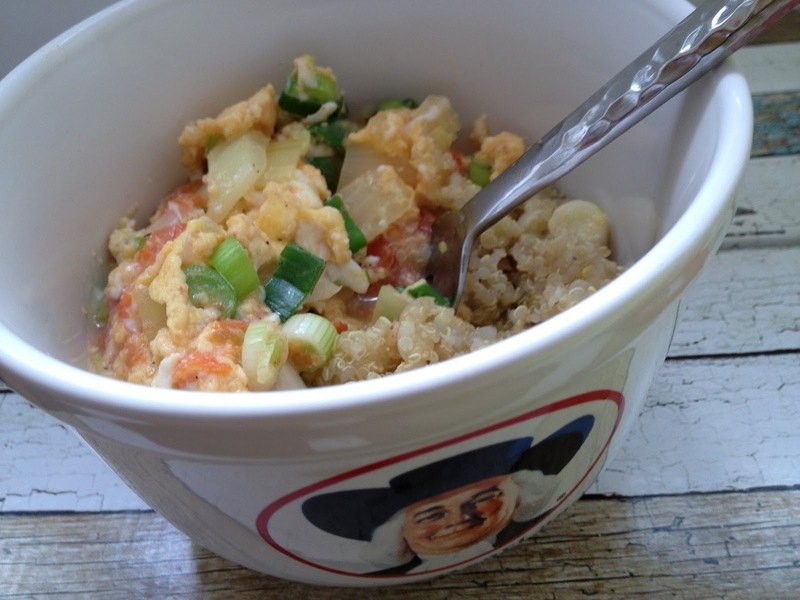 Lift the lid of your quinoa (if you haven't already), and spoon about half into your bowl. 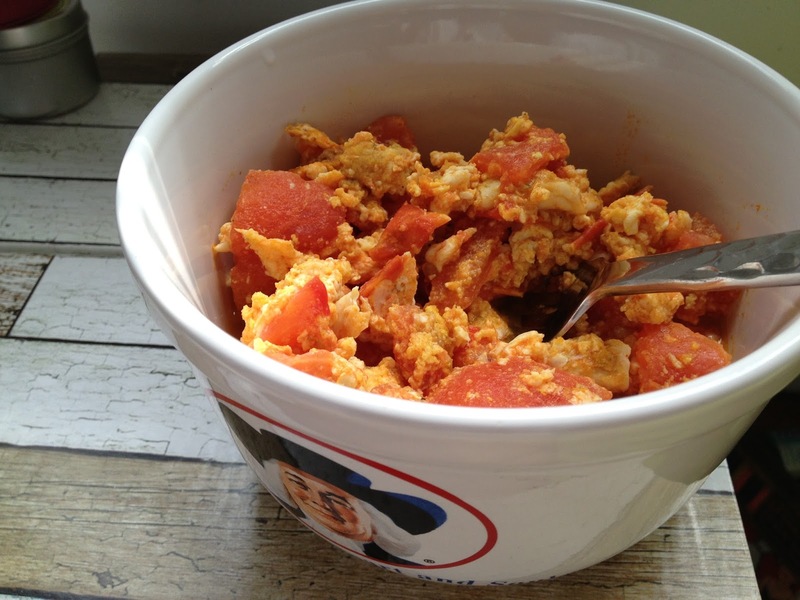 Spoon as much egg as you like over the top and add the dollop of hummus* on the side. This recipe makes about two servings of quinoa and 1 serving of eggs, if you're an egg lover, and 2 servings of eggs if you're not a big egg eater. *This tastes surprisingly delicious with hummus! I also imagine it would be good with a bit of corn or chopped bell pepper. Yay for seeds that taste like grains! Quinoa, my dear, you are not only fun to pronounce, but also fun to eat.